Are the Lakers the only alternative to Golden State that really makes sense for Kevin Durant? The Open Floor podcast discusses. The Kevin Durant-Draymond Green feud has opened the door early for the KD free agency rumors. 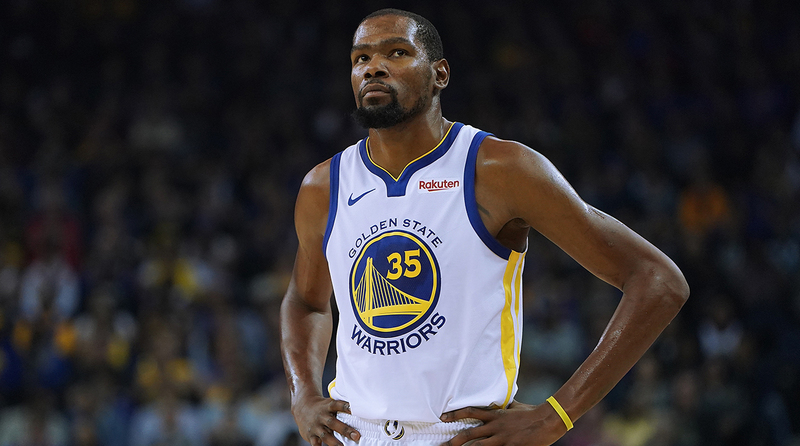 While the Warriors remain the favorites to win the 2019 NBA Finals, Durant's tenure in the Bay may come to an end. The Open Floor podcast makes the case for KD to join LeBron James in Los Angeles to form one of the greatest partnerships ever assembled. Ben Golliver: Did you see Jarrett Jack’s tweet? He said ‘Quote me on this in eight months, the Lakers are going to have LeBron, Kevin Durant and Anthony Davis’. Sharp: Well, well, well, I would be into it. I would be 100% in. As far as Kevin Durant in L.A., a lot of people have said ‘Why would he leave Golden State and go play with LeBron? He clearly wants his own team.’ First of all, if he goes to the Knicks, I would be pretty worried about Durant. Maybe he has been co-opted by Rich Kleiman and the Knicks have promised Kleiman some favors. Sharp: [Laughs]. I would be concerned. What did the Internet do to this guy’s brand? And the Knicks could have Zion Williamson, this could be the best outcome for KD, I don’t know, it’s up to him, he’s an adult, and he can do what he wants. Golliver: Don’t beat around the bush. LeBron-KD-Anthony Davis is the best big three in NBA history right? Sharp: I don’t even know. The AD element is not what’s important to me here. I just think we all need to agree that Kevin Durant teaming up with LeBron trying to go beat Steph is by far the most entertaining outcome for all of this. It’s likely the dream scenario. Also KD won’t need his own team. The Lakers are going to miss the playoffs this year and they will need a savior to come through and KD can be that guy. He would be immediately worshipped by everyone in Los Angeles and most importantly if KD goes to win one or two titles in L.A. after winning three straight in Golden State, he would be just as untouchable if he went and won a title with the Knicks in three years, which is not going to happen. It probably wouldn’t happen with the Clippers. The Lakers are the only alternative to Golden State that really makes sense to me. Golliver: Talk about a legacy. If KD wins a championship this year and goes to the Lakers and wins a title there, and winds up with more all-time points than LeBron, which is possible, that is going to be a pretty interesting argument in terms of the long term future, I don’t know why that would dissuade him from going to the Lakers. You know what’s a fool’s errand, Andrew? Having your own team. How is that working out for anybody who has their own team right now? It’s the team-up era of the NBA, where if you don’t have two stars, we are not even checking for you. And if your two stars are not good enough, we are mocking you relentlessly like we do with the Oklahoma City Thunder and more recently the Houston Rockets. You better not have your own team. If KD goes to the Knicks, that would be depressing and that would be dumb because he wouldn’t have enough talent around him. If KD goes to another situation where they already have one or two stars locked in and maybe he is just a little bit higher up on the totem pole in terms of the marketing and the touches than he gets with the Warriors, that is the smarter play. The Uber-Lakers is actually a mastermind, brilliant plan with LeBron.